Belmont Hall was built in 1911. It is much the same in appearance today as it was when it was first built. In 1901 the Christians who built Belmont Hall had already begun to meet in a furniture sales room in Station Road, Harrow, and previously in a classroom in the Greenhill Board Schools. A Sunday School and a Gospel Meeting were held in a room in Gayton Rooms above Wright Cooper’s Bakers and Confectioners shop further along Station Road. Prayer meetings were held in Kirby’s rooms on the Wealdstone bridge. In 1906 the number of Christians meeting increased from under 20 and it was decided that the room about Wright Cooper’s was no longer big enough and they began to consider building a hall. They opened a Building Fund to start saving from the weekly offering. Finding a site was a problem and took about 4 years. In 1908/9 a weeknight meeting for children was commenced in Kirby’s rooms and the numbers in the Assembly continued to grow. In 1910, the area where Belmont Hall was built was a country lane surrounded by fields and hedges; and a development known as the “The Belmont Place Estate” was begun. The land was owned by a local farmer, Anthony Hall, who had bought it from the Metropolitan Railway Company in 1890. The Christians considered the Pinner Road location, however there were building restrictions – there was only permission for houses and shops. The Christians had to canvas the whole of the neighbouring freeholders and win the approval to erect a building “for the purposes of religious work” to ensure there would be no objections to the building. In 1911, the decision was made in January to buy two plots of land and these were purchased in March from Anthony Hall by Alfred Parry, one of the members of the assembly. Building work commenced in March, progress was rapid and the building was completed in June 1911. The inaugural meeting was held on 22 June 1911 – the coronation day of George V – with an afternoon and evening service. 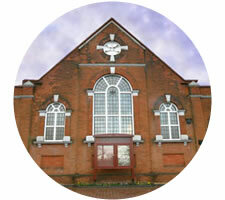 The Christians had collected £214 15s 4d for the purchase of the hall. The balance of £870 was paid by the East of England Evanglisation Trust and in October 1911, title was transferred to the trust from Alfred Parry. In October 1911 the first baptisms by immersion were held and in July 1914, the first wedding. A Bible Class for teenagers had been started and in 1921 a building to the rear of the main building was built for the sum of £200 to accommodate the Bible Classes. This building was later used for the infant class. In 1925, further accommodation was needed for the Bible classes and more rooms were build at the rear at the cost of £500. In 1935, due to growth in the neighbourhood, Belmont Hall which had previously been on the edge of Harrow was now in the centre. 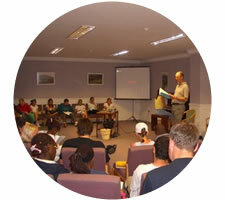 There were 244 Christians in fellowship in the assembly and 21 people were baptised during that year. There was increasing difficulty in accommodating everyone at Belmont Hall and, as a result, some of the Christians left to form 8 other assemblies across the rapidly expanding area. In 1941, 20 of the original members were still actively involved in the work at Belmont Hall and in 30 years over 200 people had been baptised. In 1947, a new venture was commenced : Boys’ Camp and Girls’ Camp. These were held for 10 days in the school summer holidays and continued for many years. In 1967, the Christians commenced a “Vacation Bible School” which attracted many children and was held for several years during the summer holidays. In 1970, central heating was installed and the ceiling in the main hall was lowered. In 1989, Holiday Bible Club (the new Vacation Bible School) was commenced in the summer holidays, and has continued annually since then. 1991 saw the commencement of the weeknight Childrens’ meeting – Treasure Hunters, which is held on a Thursday evening during school term-time. 1994 was the first year of Dartmoor Christian Camp. This is a week-long holiday for children aged 10-18 that is held during the summer holidays. In 2006, the buildings at the rear of the main building were demolished. They had suffered subsidence – cracks had first appeared in the 1940’s – and were no longer safe. These were finally re-built in 2009.